A team of archaeologists led by Dr John Fielding (John Merivale, Circus of Horrors) descends on the ruins of an ancient Mayan city to investigate the mysterious disappearance of it's inhabitants. However, the luckless explorers get more than they bargained for when their investigation of a sacrificial pool awakens the monster that dwells beneath it's waters the fearsome and malevolent god Caltiki. Though Riccardo Freda received sole directing credit, a significant portion of the film was in fact the work of Mario Bava, who also served as it's cinematographer and was responsible it's striking special effects. Drawing on a diverse array of influences, from The Quatermass Experiment to the works of HP Lovecraft, Caltiki the Immortal Monster is a unique and unforgettable sci-fi chiller which showcases these two legendary filmmakers at their most inventive. 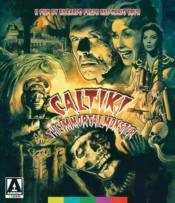 Presented here for the first time in a newly restored high definition transfer, Caltiki shines and terrifies! Like never before.